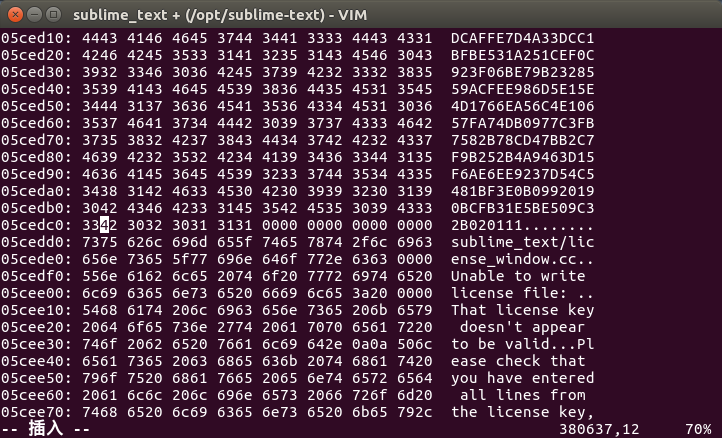 In this tutorial, I'll tell you how to crack Sublime Text in Linux or Mac. DO NOT make commercial use of anything. If you believe something on this site has infringed your intellectual property rights, please contact us. Sublime Text is a cross-platform text and source code editor, with a Python application programming interface (API). Sublime Text is proprietary software. Its functionality is extendable with plugins. Most of the extending packages have free-software licenses and are community-built and maintained. Sublime Text lacks graphical setting dialogues and is entirely configured by editing text files. You can get the Sublime Text from http://www.sublimetext.com/. I recommend you to download Sublime Text 2, because Sublime Text 3 is still in beta. And you will see a string like 4333 3342 3202, as the image shows below. And then, Save the file and exit. At last, start the Sublime Text and enter the license below. Enjoy programming using Sublime Text!